pressing button 1 twice unlocks all the doors and the tailgate. Press the locking button 2. The hazard warning lights flash twice to indicate that the doors have locked. If a door or the luggage compartment is open or not properly shut, or if a RENAULT card is still in the reader, the doors and luggage compartment lock then quickly unlock and the hazard warning lights do not flash. If the vehicle has been unlocked but neither the doors or tailgate are open, it locks again automatically after two minutes. The card buttons are deactivated when the engine is running. 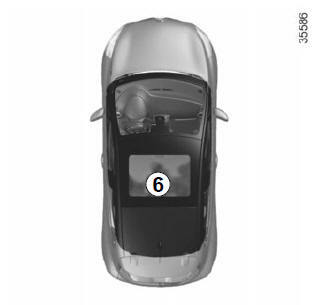 two flashes indicate that the vehicle is completely locked. Press button 4 to unlock/lock the luggage compartment. If you open a door while the engine is running and the card is not in the reader, the message “KEYCARD NOT DETECTED” and a beep will warn you. The warning disappears when the card is inserted in the reader again. The interior lights come on for approximately 30 seconds when button 3 is pressed. 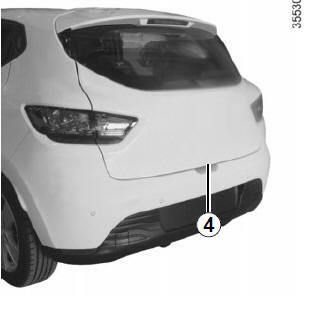 This can be used, for example, to identify the vehicle from a distance when parked in a car park. Note: pressing button 3 again switches off the lighting. 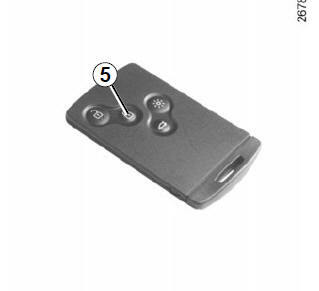 On equipped vehicles, in addition to the functions of the remote control RENAULT card, it can be used to lock/ unlock without using the RENAULT card, when it is in access zone 1. Do not store the RENAULT card anywhere it may come into contact with other electronic equipment (computer, PDA, phone, etc.) as this could hinder its operation. With the RENAULT card in zone 1 and the vehicle locked, press button 3 on handle 2 on one of the two front doors: the vehicle will unlock. Pressing button 4 also unlocks all the doors and the tailgate. NB: the vehicle cannot be locked again for three seconds after unlocking after pressing button 3. 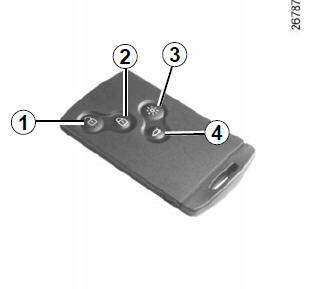 There are three ways to lock the vehicle: remotely, using button 3, or using the RENAULT card. 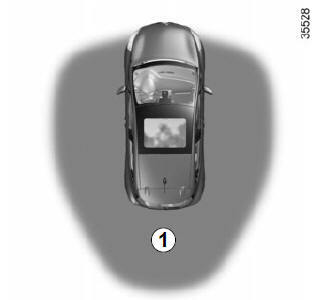 With the RENAULT card on you, and doors and tailgate closed, move away from the vehicle: it will lock automatically once you have left zone 1. Note: the distance at which the vehicle locks depends on the surroundings. Locking is shown by one short flash, then one long flash of the hazard warning lights and a beep. The beep may be switched off. Please consult an authorised dealer. If an opening element (door or boot) is open or not properly closed, or a card is in the passenger compartment (or the card reader), the vehicle will not lock. In this situation, no beep sounds and the hazard warning lights do not flash. With the doors and boot closed, press button 3 on one of the front door handles. The vehicle will lock. Locking is shown by two flashes of the hazard warning lights. If a door or the boot is open or not closed properly, the vehicle will quickly lock/unlock. 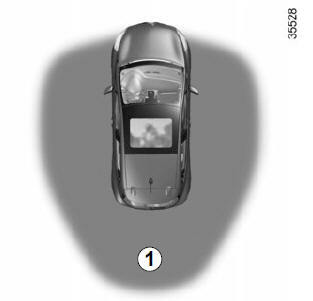 Note: a RENAULT card must be within the vehicle's access zone (zone 1) to be able to lock the vehicle using the button. 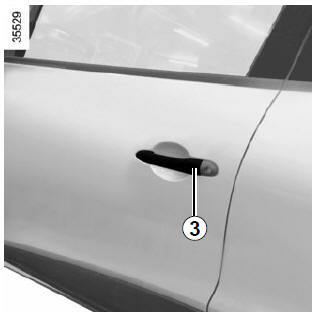 With the doors and luggage compartment closed, press button 5: the vehicle will lock. The hazard warning lights flash twice to indicate that the doors have locked. Note: the maximum distance at which the vehicle locks depends on the surroundings. a card is still in zone 6 (or in the card reader) and no other card is in the external detection zone. With the engine running, if you open and close a door and the card is no longer within range 6, the message “KEYCARD NOT DETECTED” and a beep warns you of this. The warning disappears when the card is again within range 6.